How to get there: A good starting point is the small place Søre Bjørkedalen on Hwy. E-39 about 20 km north of Nordfjordeid (between Nordfjordeid and Volda). This place is west of Bjørkedalsvatnet (elev. 25m). If coming from the south, you will first cross a river, then pass the road to Hjelmeland (a road through the valley Hjelmelandsdalen). Very shortly thereafter, there is a small road going left. This road serves a small campground in the summer season. A few hundred meters from the main Hwy. there is a four-way intersection. The left turn crosses the creek and serves some farms, while the right turn serves the campground. The road to be followed continues straight ahead. In the winter, find parking near this area. In the summer, one may be able to drive up this forest road towards Laurdalssætra. There is a sign posted that this is a self-serve toll road, however this sign is posted further up. There is a side road at about 300 meter elevation to the right, this is marked on the M711 map and the trail goes left from this sideroad, about 100 meter from where it branches off. However, there is now a new sideroad going right about 100 (vertical) meter higher, locate this and follow it (fairly horizontally) to the spot where it crosses the creek, park near this area. Route description: In the winter, ski straight up the forest road as it bends and makes several distinct left curves while climbing up the valley on the right hand side of the creek. Take the third, distinct road that branches off to the right at about 400 meter of elevation (see also the summer description above). Locate the creek that comes down from Tuvedalen, the road ends shortly beyond the creek. Do not cross the creek, rather continue uphill along some smaller, but distinct ridges where the vegetation is quite open and gain the entrance to the (hanging) Tuvedalen valley above. This small valley is between Litletuva (896m) on the right and Storetuva (910m) on the left. Storetuva is further connected with the higher point 1010 a bit further in. Ski or hike in this small valley and straight up the slope at its end between two creeks, the leftmost being a bit more distict. In winter the two corresponding gullies are quite easy to see. At the top of this slope, a more level saddle connects to a new ridge that climbs to point 1073. The best ski route is just left of the main ridgeline. At the top of this slope, one will see the summit of Trollvasstinden for the first time. Continue along a more gentle uphill to the base of Bytingstinden (1250m). In the summer, there is a trail traversing on the left (south) side of Bytingstinden to the saddle between this peak and Trollvasstinden. 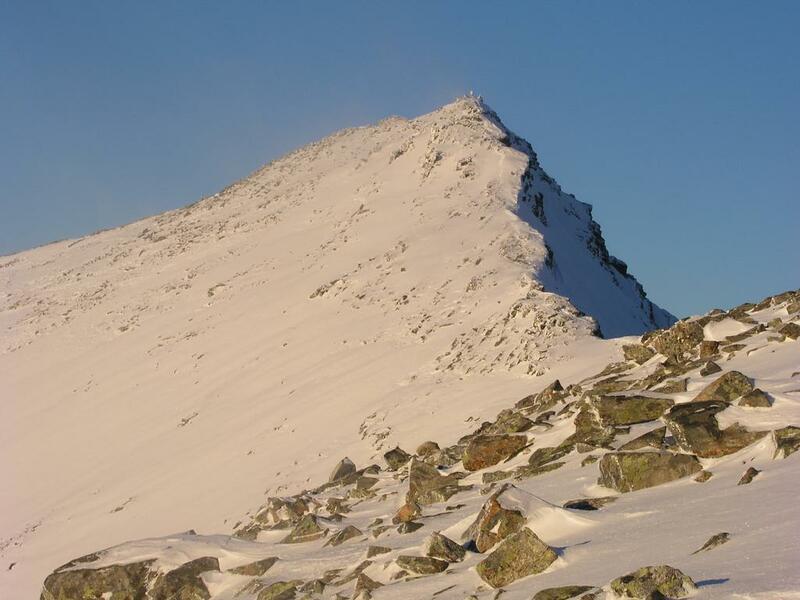 The ascent of the ridge to the Trollvasstinden summit is most likely easy and the entire route is most probabely YDS class 2. 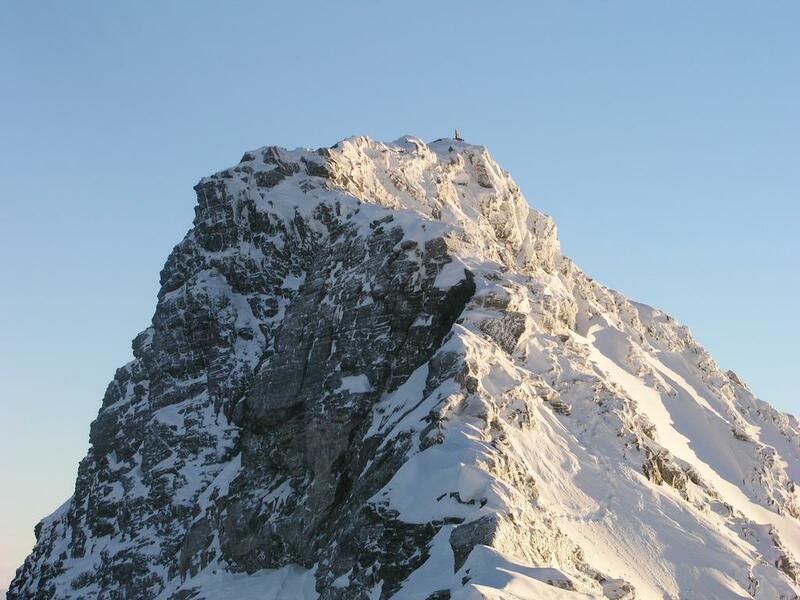 However, also in summer a fun alternative would be to traverse the summit of Bytingstinden and the connecting ridge to Trollvasstinden, YDS class 3. 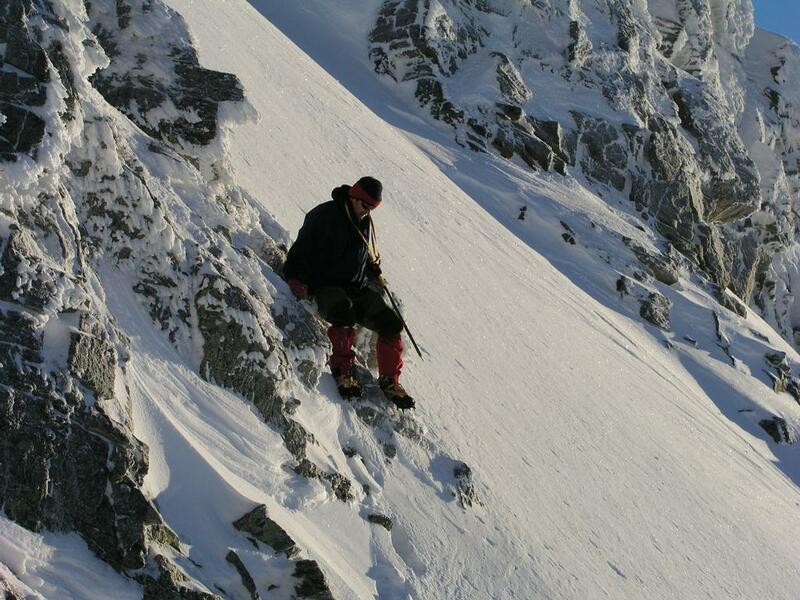 In winter, the conditions can be quite different, the same traverse can be done, or alternatively, (as we did) climb Bytingstinden first, then traverse to Trollvasstinden. The ascent of Bytingstinden is straightforward. 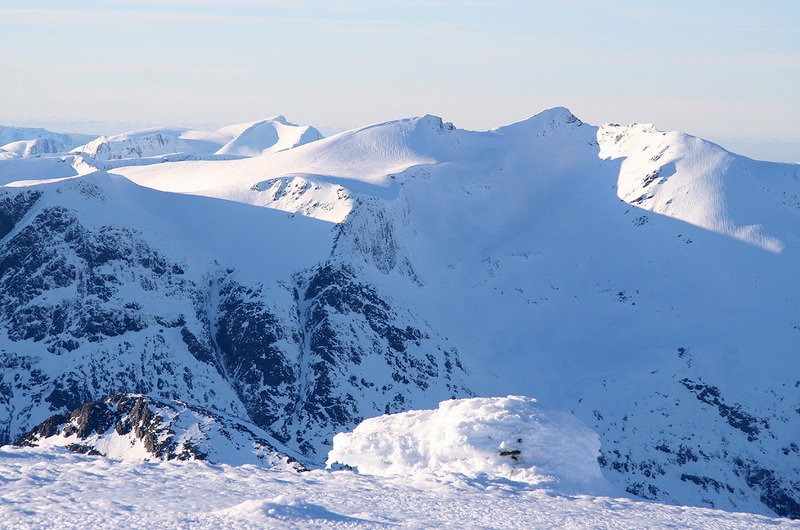 From the cairn, there is a short, nearly flat and fairly exposed ridge to the point where the ridge drops towards the saddle of Trollvasstinden. The technically easiest way down has considerable exposure (to the right) the first few meters. In order to avoid this, one may consider a short downclimb (earlier and to the left) that is more protected, but YDS class 4. The remaining downclimb is class 3 if staying on the ridge and only circumventing a few obvious sections with short traverses slightly below the highest ridge on the left side. Once in the saddle, the climb back up to the Trollvasstinden summit is easy with a sufficiently wide ridge and a rather moderate slope. Comments: I did this climb with Arnt Flatmo. He did a great job breaking trail all the way up to the treeline. We started at dawn around 0850, hit the summit at 1325 and started the descent about 15 minutes later. We were back at the car at 1525 after a very good climb with beautiful weather and spectacular scenery all around. Ascents in this area in January are not common. This was my very first peak in the "Sunnmøre Alps", no question that I shall return to this land of sharp peaks and beautiful fjords. Trollvasstinden and Bytingstinden as seen from Matøskja, January 2009. Arnt considers his future, while descending from Bytingstind. Bytingstinden we traversed this peak. 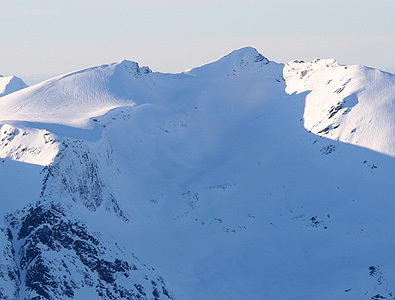 The south ridge of Trollvasstinden, this ridge poses no difficulties.